MazikDuo - Madrid Presentation CD - La Quinta de Mahler"
JEWISH LIFE, PORTRAITS OF THE PAST, a sonority with flashes of history and protagonist of the new MazikDuo's CD. A singular project between the fusion of classical music and klezmer, where both genres coexist showing a varied music but with a common theme, as is the history of the contemporary Jewish community. Based on the idea of how music constitutes culture, Jewish Life forays into Jewish history and identity, it explores some its remnants that were scattered throughout 20th century culture. During the hostile climate of the 20th century, music continued to be created in diverse contexts, inhabiting disperse individual memories. It sprang up within the crude walls of the concentration camps; it ruminated in the memory of a young person exiled from homeland and history. It was a form of expression used by indignant mavericks as well as a nostalgic evocation sung far from home, far from across the sea. That’s why Tolo Genestar and Marc Sumsi present us with works that germinated in very different moments and contexts, from the darkest sonority of World War II (Messiaen, Weinberg) to the most frenetic melodies of his most popular festive genre (Schoenfield, Kovács, Bloch, Saurer). Therefore, this disc reunites traits from the past while narrating a very particular history using its own testimonies. It gives form, intention and meaning to the isolated parts of an invisible puzzle which only exists because there are still past and present voices which remember them, and which strive to understand them. The friendship between the two performers, who make up MazikDuo, existed prior to the duo's creation. 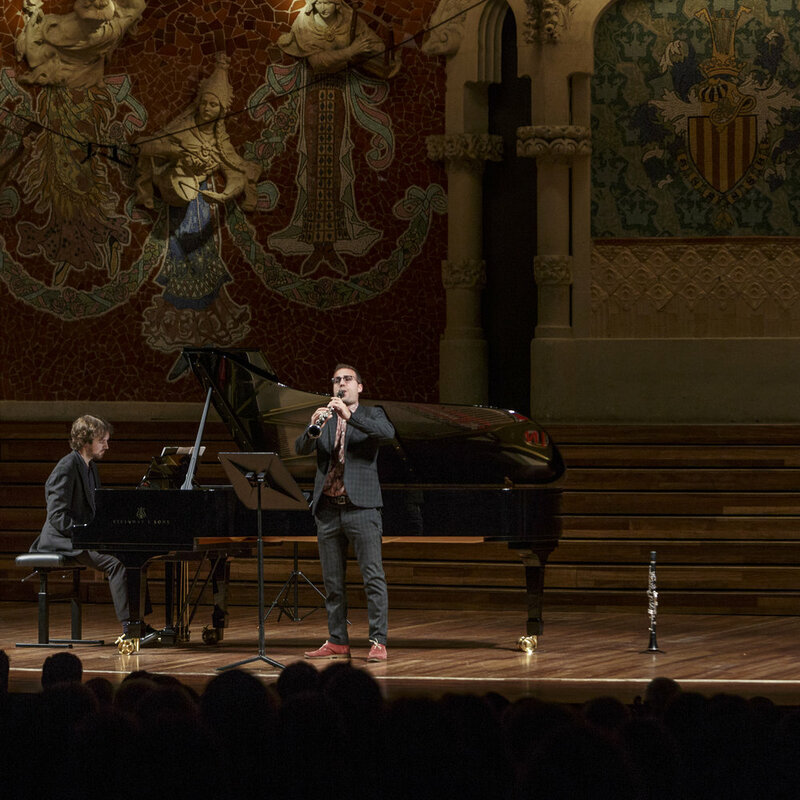 Tolo Genestar (clarinet) and Marc Sumsi (piano), both born in 1991 graduated the Conservatori Superior del Liceu de Barcelona in 2013, where Marc was garlanded with first prize at the end of his degree. Their respective teachers were Isaac Rodríguez and Miquel Ferrer. With the aim of polishing their musical prowess, Tolo continued his studies at the National Conservatory in Nice (France) and Marc went on to specialize as a harpsichord player in the ESMuC. 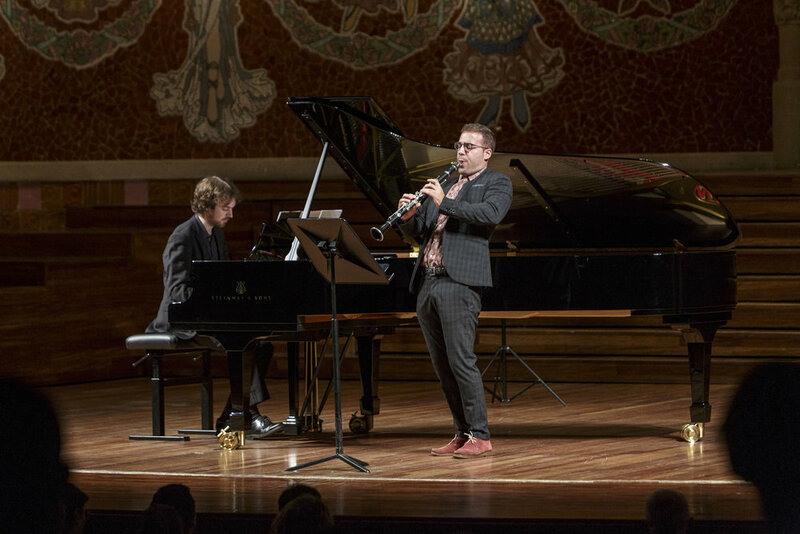 They have both gone on to win many prizes as soloists, Tolo was presented with first place in the Arjau 2015 clarinet prize and a place in the final at the International Birkfeld competition in 2015 in Austria, however, his greatest achievement came in 2016 when he was awarded the Special UNESCO prize in Barcelona. As a result of this, he went on to tour Mozart's K622. Meanwhile, Marc was also presented with the first prize in both Vilafranca and in the Early Music competition in Tolouse (2016). Jewish Life came into being just after this period studded with personal successes. It is the point at which maturity, stylistic prowess, and ambition have all merged to open up new horizons. It premiered at the Teatre Principal de Maó in 2016, and then in Mallorca, Ibiza, Catalonia, Andalusia, Madrid where it has performed in the prestigious Juan March Foundation Hall, Palau de la Música of Barcelona, Singera Festival of Warsaw, Festival de Torroella de Montgrí, among others. MazikDuo culminates his project with the recording of Jewish Life, portraits of the past (2017) by the record label Temps Record S.L. and with the support of Institut d’Estudis Baleàrics. "The clarinetist Tolo Genestar, supported in his instrument of penetrating loudness, being incisive when necessary, provides a highly virtuosic and great knowledge of the many intricacies of this music of Jewish inspiration, nothing simple in the strictly technical plane for the interpreter that is about it." It is a brilliant album, an enriching window to the rich sound world of Jewish culture. MazikDuo's first personal project, which is presented in this way in society as a duet of instrumentalists and as a prestigious brand. (...) A cultural product of high musicological value and historical and social interest.